Extensis Vitae: The Shattered Land is now on sale at Amazon, Apple, Barnes & Noble, and Kobo. Time is running out for Michael Reznik as he searches for a way to deactivate his body's kill switch before his time literally expires. Reznik makes his way to the surface with the mysterious Rin as his guide and discovers a post-apocalyptic wasteland that is brutal and unforgiving, a land totally foreign to the country he knew. Gangs of vicious marauders and slavers, nefarious corporations, and mysterious creatures preying on people in the night will challenge Reznik every step of his journey. His potential allies are far outnumbered by the growing number of enemies standing in his way. As Reznik struggles to survive in this new world, Rin searches for her own redemption, to make up for past failures. Will Reznik be able to find his solution with the clock ticking down? 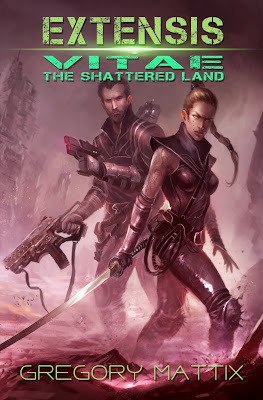 Extensis Vitae: The Shattered Land is the second volume in the gritty, action-packed Extensis Vitae series.